Is this Ich after copper treatment. please help unsure what to do. tang has had 14 day copper treatment. now on day 4 of praziquantel. after placement in seperate tank with ammo lock while QT was thoroughly cleaned. eating well had HLLE which has now near fully healed up. 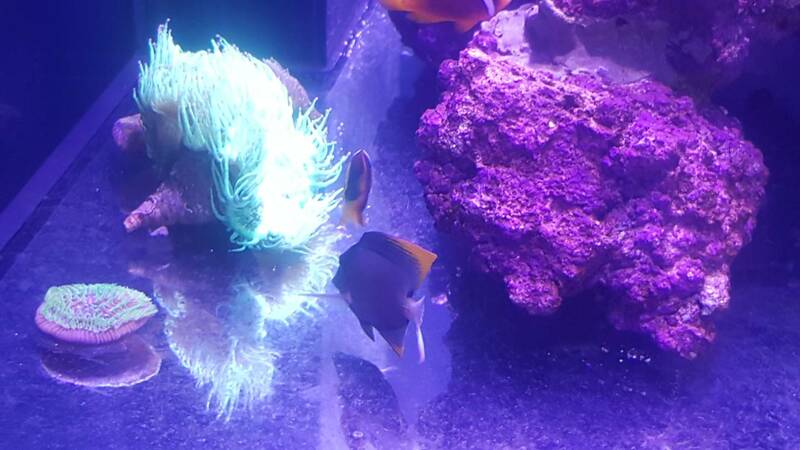 From day 1 i have been feeding nori GHA & vitalis algae flakes plus daily dosing of aquaforest fish V into water column as he wont eat when soaked even with garlic. Has never shown signs of ich from day 1.
could it be ich ? or something due to praziquantel ? should i reintroduce cupramine alongside the praziquantel for another 14 days ? ir assume its bacterial and go with metroplex/kanaplex + furan-2 ? two tiny spots leads me to think its not ich after no signs it seems odd. That looks to be too big to be ich. It’s usually hard for a camera to pick up ich clearly at this distance. And I can definitely tell that fish has two white spots close to the tail so not ich from me. that is ich... 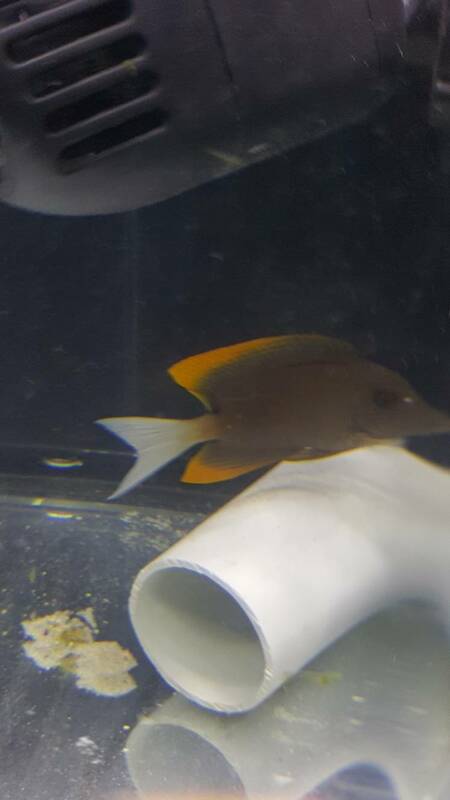 I have the same size on my powder brown tang that I have to treat. Like ich in the picture. Imo that looks to big to be ich. Ich looks like salt. That looks more like a parasite or something. It doesn't look like ich to me either. It might be worth doing a quick freshwater dip. They will fall off it's worms. As others have said, it looks too big to be ich. Looks like Lymphocistis aka lympho which is usually harmless and will fall off within a week or two without any intervention. Don't stress the fish more. If that is what it is which I am pretty sure it is, just feed it well and don't stress it more. It will go away on its own. One thing about lympho that helps identify it is that it looks like little cotton balls. Regardless, you probably should hold off on removing him from QT until it passes. It can be contagious not that that’s usually a problem but without being 100% certain that it is in fact lympho, I don’t think it’s really worth risking your other fish. I agree with slief about being careful here. It very well could be lympho, but I wouldn't go into the display with it until you're sure what you're dealing with. Does the fish scratch on tank equipment. Yes I would dip in fW 2 or 3 min and see if it falls off . 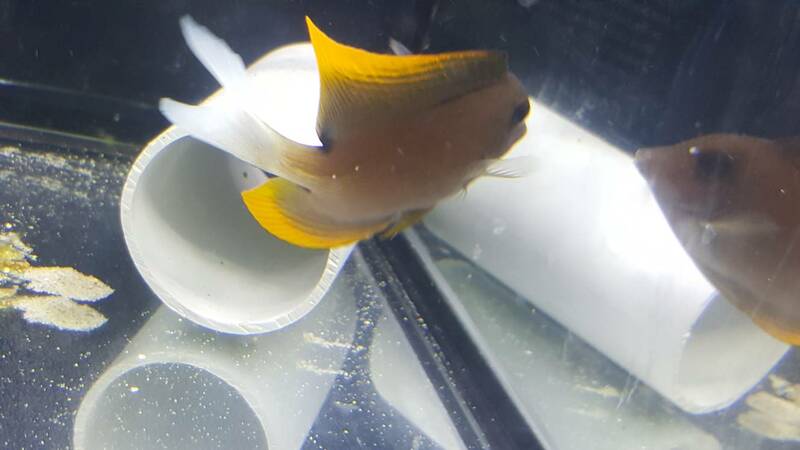 I have usually seen lympho on edges of fins and mouth . Not saying no to lympho. Lympho does look like tiny balls of cotton. Hard to say in picture. 3rd the notion that he should remain longer in QT. If the spots spread and multiply then I would consider ick . Is he eating today ? Does he look stressed? he doesnt look stressed at all, breathing normally eating nori and swimming around casually .. during the cupramine treatment there was a little bit of rubbing up against powerhead/heater/heavy breathing .. but after the 14 day treatment & removal of cupramine he has been non stop feeding eating well getting fatter each day swimming around/occasionally hanging in the back corner of the tank during times where theres lots of traffic .. every afternoon i come home and his nori is gone .. feeding 5-6 square inch pieces each morning on the clip & its all gone when i get home no more rubbing/heavy breathing etc, he had HLLE when i got him but it is pretty much unnoticeable/healed now .. finishes his first round of praziquantel two days from now "sunday" in which case ill do a 100% water change/QT cleanout and redose for one more 7 day treatment .. thinking i might extend his time by 7 days so that gives him 21 days from today in QT too see if it is ich ..
oh and i was planning on doing a FW dip this afternoon but the spots are gone now and hes acting fine swimming/eating/no heavy breathing/no rubbing .. so im leaning more towards lympho .. would kanaplex/metroplex be a good option after the second prazi treatment providing it doesnt turn out to be ich ? would threse meds potentially help with lympho .. from what ive read briefly on it theres no actual treatment for it ? and the fish kicks it providing good water quality/diet etc ? .. providing it doesnt turn out to be ich .. which i dont think it is .. fingers crossed .. oh and theres no other fish in the display atm as its a newer setup i upgraded too, my other fish are in my 2x2 cube tank, pair of tomato clowns in that one ill putting through a cupramine treatment/prazi before adding to my new display ..
not taking any risks adding fish directly to the new tank & losing any fish. 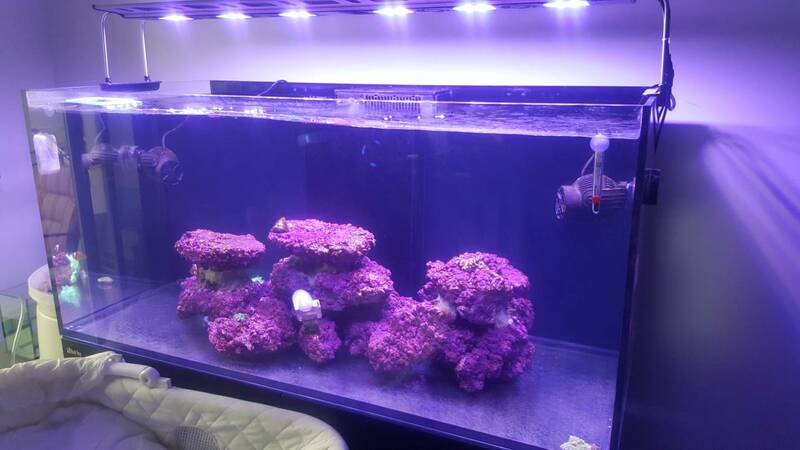 I have a question regarding the tank transfer method..does that method make it where you don't need to do a copper treatment? Also should he transfer his fish into another quarantine tank after the freshwater dip? Not sure if the parasites can stay in the water of his quarantine tank and get back on his fish, or if they're only on his fish and he's safe to put him back in after the freshwater dip. from my understanding of the tank transfer method aquaman it involves taking advantage of the ich lifecycle in the stage where they drop from the fish "eggs .. and you transfer the fish between two tanks for around 14 days while matching salinity & temp while cleaning the other tank each time you transfer .. theoretically removing free floating/ich eggs .. so if you look at it that way providing the fish is eating etc then i dont see why there would be a need for copper imo .. but to be honest ive done very little research on this route myself & im sure someone else who has actually done it could chime in and answer/confirm further. but from what i know about it im 70% sure this method doesnt involve any copper. UPDATE on tommy the tomini .. hes had his prazi treatment, ive been keeping a stern watch throughout & i didnt notice anything at all in regards to worms/internal parasites etc from start of copper to end of prazi .. definitely in the clear of ich .. hes been eating non stop, lympho has also cleared up .. he has come quite a long way so far from having some HLLE and slightly skinny/sitting in the same spot to a beautiful tang who might i add is really starting to colour up and earn that name .. flame fin tomini. So all in all not wanting too keep him cramped up i decided it was time to move him over to the display .. hes now cruising around in his new home waiting for some friends to join him once they get the all clear to move in from the landlord reference checks & all plus i gotta tell them theres no pets like ich or internal parasites allowed .. im sure they'll be ok with it .. he is hiding amongst the rocks somewhat here & there but overall i can tell hes happy to have some length to swim around in .. im sure over the next few days he will be out all day enjoying the tank. pics to come soon once he gets a little more daring/comfortable, cheers for the ID on lympho guys. TTM is great way to treat for ich but it will not treat for velvet which is becoming more common nowadays and is a super fast killer. To cover both velvet and ich you want to use copper or CP (also treats uronema but you'll need a vet to give you a RX for it). Also if you are treating with copper or cp, it is recommended to treat for a min of 30 days unless you have a second qt (at least 10' away) that you can move the fish into after 14 days of being in full thereputhic levels without any changes to the concentration. Only the fish should be transferred and no equipment with minimal water as possible to prevent cross contamination. Observe for another 3-4 weeks and if no symptoms good to add to display. Congrats on the new addition and successful qt! 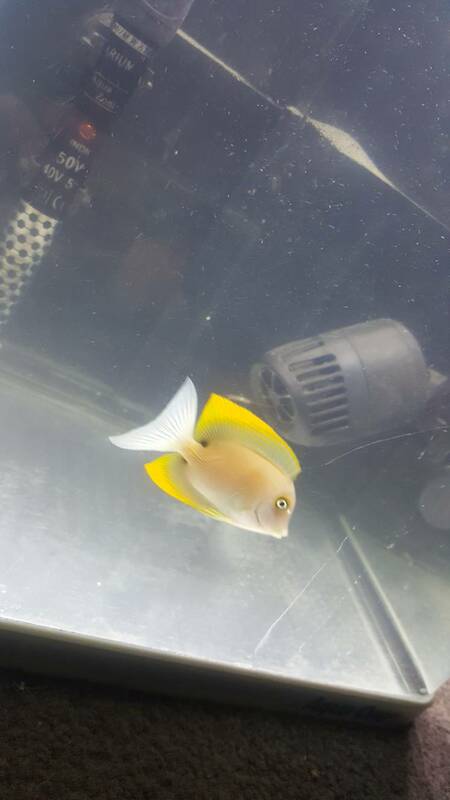 So the tomini tang has really fattened up over the last week and im pleased to say he is doing exceptionally well apart from some lympho that appears to be very slow to clear up but in due time im sure it will drop off and he will be fine ..
tanks doing well still not where i want it ewuipment wise but for now its pretty solid .. first things first get a different set of wavemakers in there these things are meant for a 6 foot tank .. thinking 1 octo OP-4 on random will do and then corals wont be blowing around everywhere then a uv steriliser for clarity .. p.s. 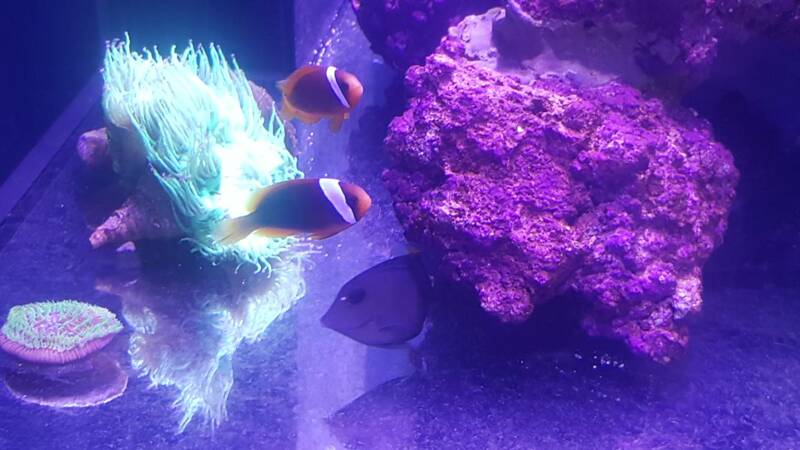 i usually dont keep fungia next to euphyllia XD .. but i dont mind moving them once every day or two.